High performance engines reject a substantial amount of heat through the oil system. Maintaining oil pressure along with an increase in actual volume will help dissipate heat and stabilize oil temperatures. Std.Gear 12mm gear. Additionally, sustained High RPM use may cause oil starvation at the rod and main bearings. Increasing the oil volume will help to prevent bearing damage and engine failure. 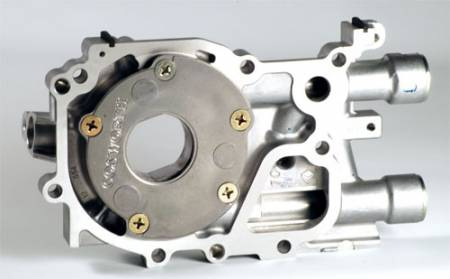 The New High Volume Subaru EJ20/EJ25 series oil pump utilizes a completely new inner and outer 12mm rotor to increase volume by 20%. Suggested applications include drag, track day and race use. Each kit includes all required mounting hardware and seals.